Easy Install Shower Systems: Luxury Custom Shower Systems for Less! We came up with our Easy Install Custom Luxury Shower Systems as a solution to combat the high cost of installing a Full Custom Shower System. When you research shower design you inevitable will come across the idea of installing a Shower System. 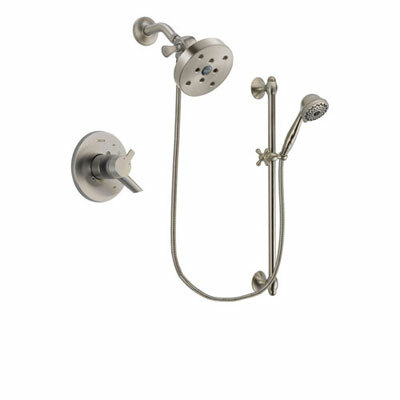 Full Custom Shower Systems are great and we sell many of them every day, however they are not right for all situations. If you are like most of us and are operating on a tighter budget, an Easy Install Shower System might be perfect! If you are searching for shower ideas for a bathroom renovation (as opposed to new construction) an Easy Install Shower System might just make a lot more sense. 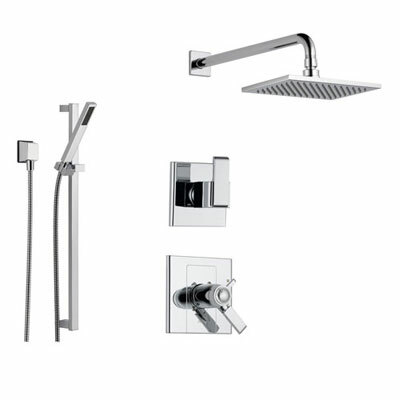 Whether you are looking for a Shower Faucet System or a Tub and Shower Combo System we have what you need! Easy Install Shower Systems are designed to give you the benefits of the best full Shower System but at a significantly lower cost. Read on to learn more! These terms will assist with helping you understand this article. We have tried to keep things jargon free but this glossary is included to help clear up a few commonly asked questions. 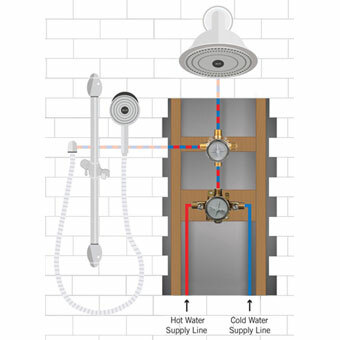 You can skip ahead if you already have a basic understanding of how Shower plumbing works. 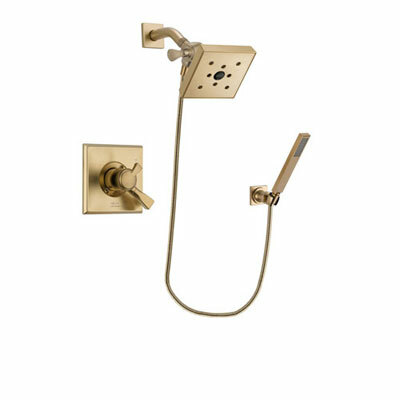 FULL CUSTOM SHOWER SYSTEM: This refers to a Shower System where the Diverter is installed in the wall. 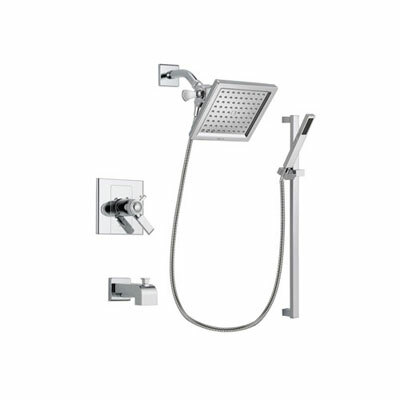 The Shower Systems can be designed to have multiple Showerheads, Hand Shower Sprays, Body Sprays, Ceiling Mount Showerheads. Basically any idea you have within the technical limitations can be accomplished. Hence the word "custom" in the name. EASY INSTALL SHOWER SYSTEM: This refers to the Shower Systems we have designed to combat the high installation costs of a Full Custom Shower System. Easy Install Shower Systems are not customizable in the same way, however they offer many of the benefits nonetheless. By allowing you to run both a Showerhead and a Hand Shower at the same time, Easy Install Shower Systems deliver a luxury Shower experience but at a much lower cost than a Full Custom Shower. TRIM KIT: This refers to the parts installed on the outside of the wall that attaches to the tile in your Shower. The Trim Kit is the part of the Shower you actually see. 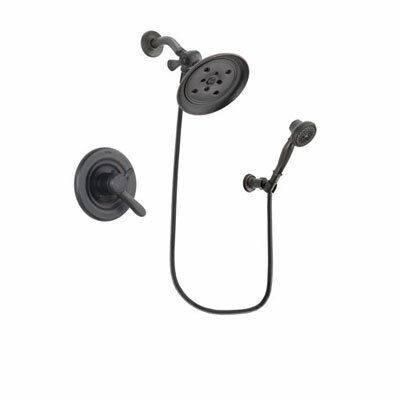 In a Shower System the Trim Kit includes the Showerhead, Hand Shower, Shower Arm, Shower Flange, Shower Control, and Diverter. It also includes the Tub Spout in a Tub and Shower Combination. In a standard Shower Faucet it contains what you see on the right. By itself the Trim Kit has no functionality. It must be paired with the correct Rough-in Valve in order to function. The Trim Kit is designed to attach after the Rough-in Valve has been installed inside the wall. ROUGH-IN VALVE: This is the part of a Shower that installs inside the wall and connects to the actual pipes. 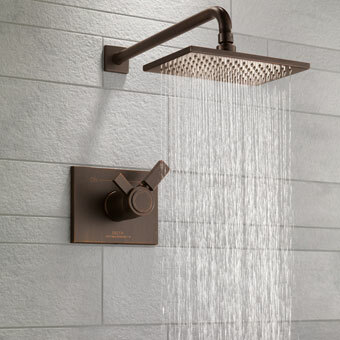 A Shower Rough-in Valve connects to your home's hot and cold water lines. The hot and cold water runs into the Shower Valve to be mixed. Sometimes a Shower Rough-in Valve is referred to as a Mixing Valve. The warm water can then be sent via pipe out through the Showerhead. 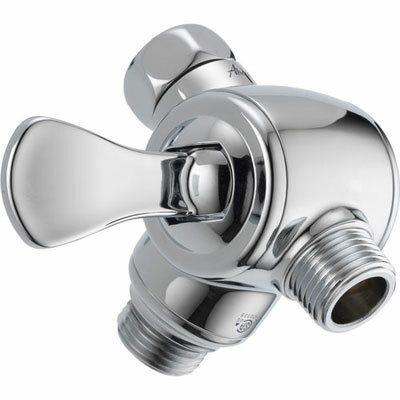 In Wall Diverters, like those featured in Full Custom Shower Systems also have a Rough-in Valve. This Rough-in Valve sits between the Shower Valve and the output pipe. It allows you to divert the warm water to multiple Shower outlets. DIVERTER: In this text we discuss two types of Diverters. 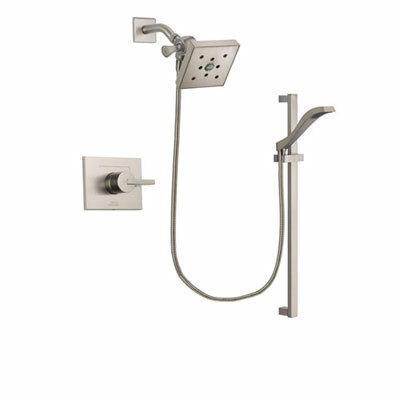 A 3-Setting in Wall Diverter (Full Custom Shower) and a 3-Setting Shower Arm Mount Diverter (Easy Install Shower). In the end, a Diverter does nothing more than divert water. It acts as a gate, sending water where you want, or stopping water from going where you don't. 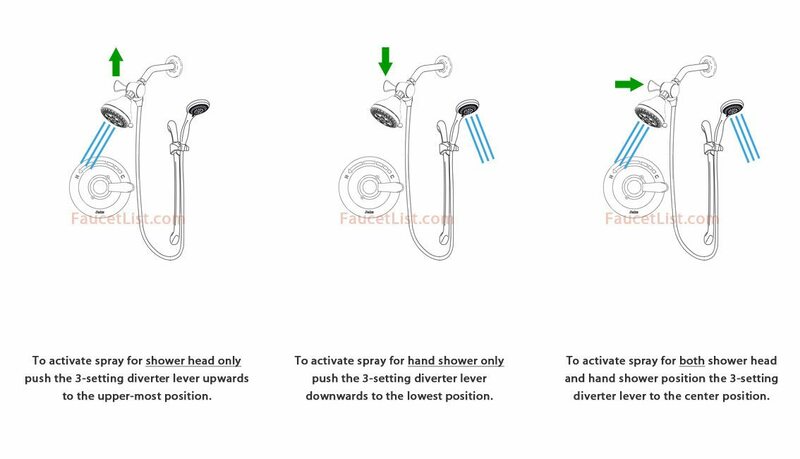 The Diverter is what gives you individual control over each Shower Spray. 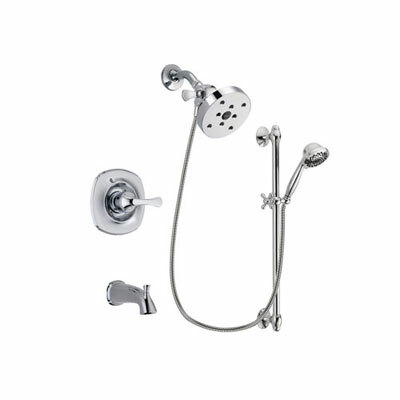 It is what allows you to run both the Hand Shower and Showerhead together at the same time. 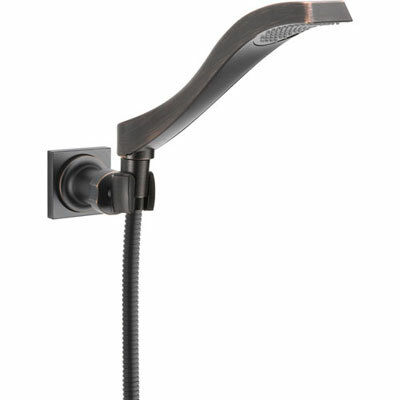 HAND SHOWER: Handheld Shower typically mounts to the wall of your Shower. It sometimes rests in a bracket and other times attaches to a slidebar. It literally is a Showerhead that comes off in your hand allowing you to direct the spray however you want. 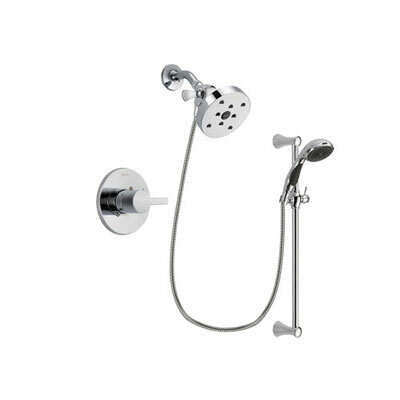 Adding a Hand Shower to your Shower offers many benefits which a Showerhead alone cannot offer. 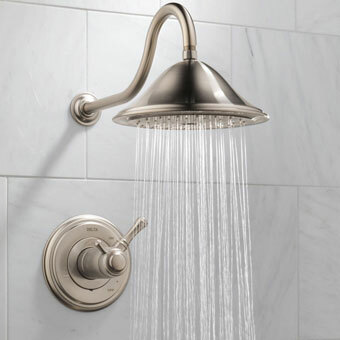 SHOWERHEAD: Pretty self-explanatory but this term refers to the Showerhead mounted to the wall as opposed to the Handheld Showerhead. Sometimes there is confusion so we just want to make the distinction. 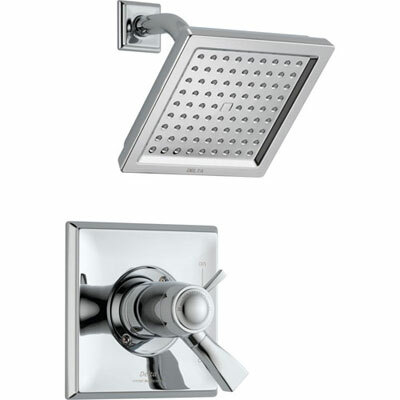 Showerheads come in many styles. Typically a Showerhead only refers to the actual spray portion. 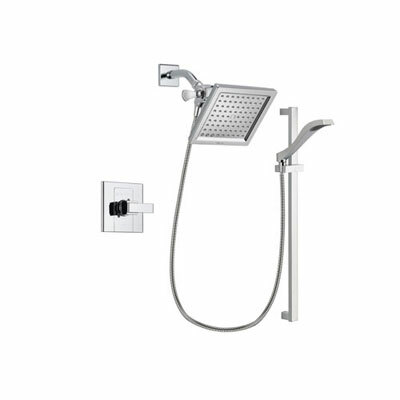 In the picture to the right you will also see the shower flange and shower arm which are required to cover the hole in the wall and to supply water to the Showerhead (respectively). 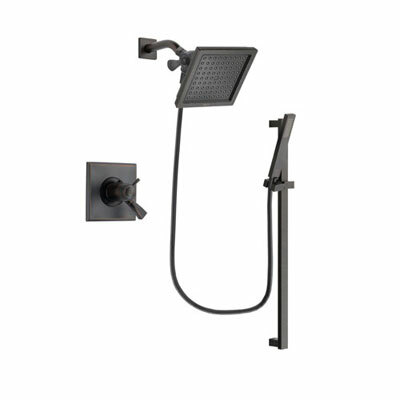 All Easy Install Shower Systems feature a Shower Control, Showerhead, and Handshower. The system is designed with 3 settings allowing you to run the Showerhead only, Handheld Shower only, or both at the same time. 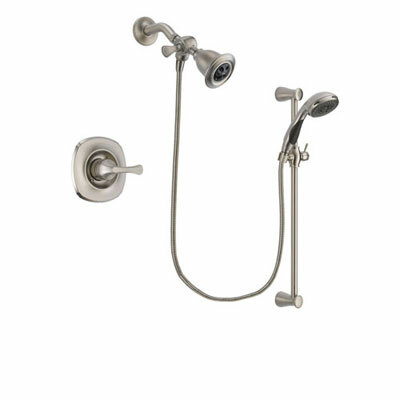 We also offer some Tub and Shower Combo Systems which add a tub spout function. 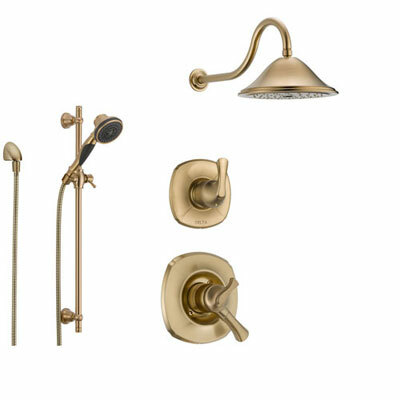 Full Custom Shower Systems are fantastic however they also come with a price tag. 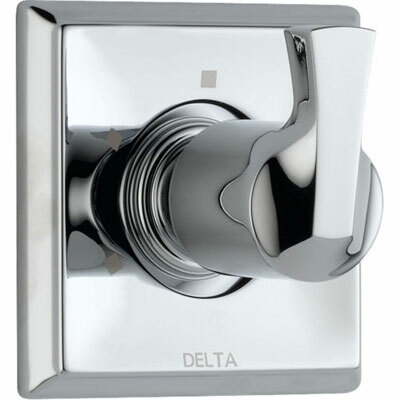 While Delta offers relatively affordable Shower Faucet Systems, the price of the fixtures is not the only thing to consider. The cost to install a Shower System is not insignificant. Depending on the situation, simply installing the plumbing for a Full Custom Shower System in a new construction project could take 6-9 hours. Given the average plumber charges $60-90 per hour and you are looking at an installation cost of $360-810. 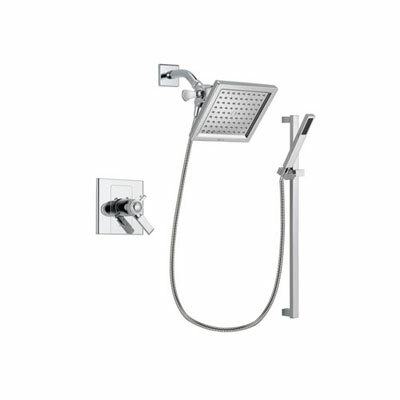 In a bathroom renovation project (ie not new construction) the costs might even be significantly higher as you would have to completely open up the walls to run the water lines to the various shower spray systems (eg body sprays, handheld showers, ceiling mount shower heads, additional shower heads etc.) You would then have to close the wall back up and re-tile. If only there was a better way to install a Custom Shower System without going through all this hassle! You can't beat the ultimate luxury shower experience offered by a Full Custom Shower System so there's no choice but to pay right? There's no choice but to deal with the hassle and cost of installation because the end result will be worth it right? But what if there was another option? At FaucetList.com we are a small family business and understand the concerns of normal every day real people who are not multi-millionaires but still want a bit of luxury in their life. We are not a huge corporation so we understand what it's like to want nice things also not want to break the bank. So we starting thinking...was there a way to offer the benefits of a Full Custom Shower System but without the huge cost of installation? This lead us to the creation of our Easy Install Shower Systems. 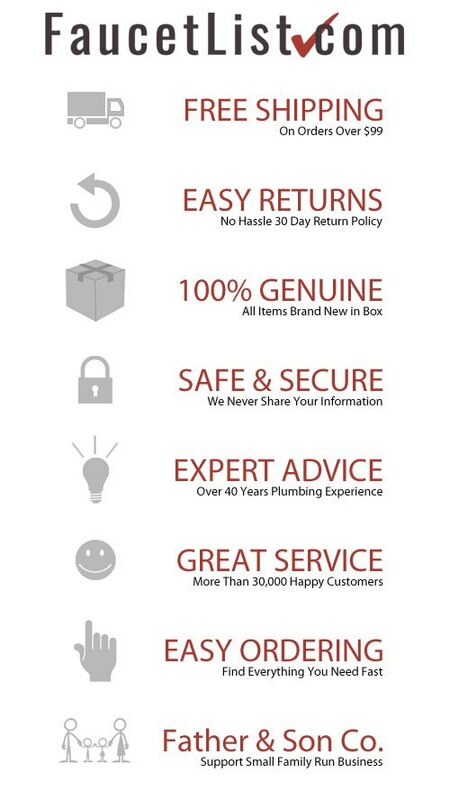 We used our more than 40 years' experience in the plumbing industry to develop our Easy Install Delta Shower System packages. 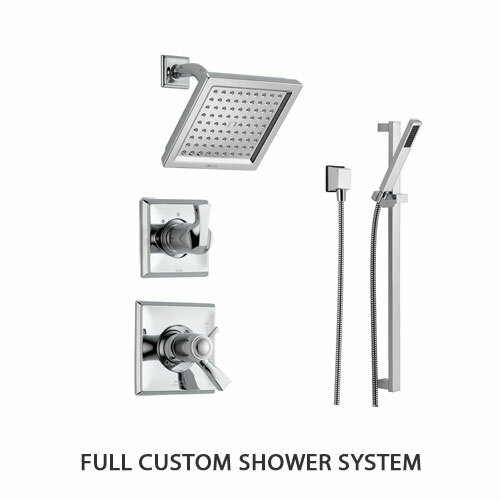 We chose to create these systems using Delta Faucet brand products because Delta is an industry leader in Shower Fixtures. All components parts in our Easy Install Shower Faucet System packages include a lifetime warranty on both the operation and the finish. It's very rare in the plumbing industry to find warranties on the finish, especially for fixtures used in a wet environment like a shower. This really made Delta stand out to us as the obvious choice as the brand to partner up with to create these systems. You not only get a guarantee that your products will function for life, but you also get the peace of mind knowing they will look great too! 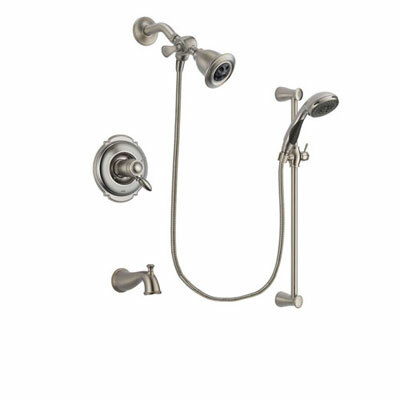 FaucetList.com is an Authorized Online Retailer for Delta Shower Fixtures so all our products are 100% brand new, in the box, and the warranty will apply to you as the end user. To show the difference between a Full Custom Installation and an Easy Installation we have chosen a very similar Shower System and use it to illustrate 2 different ways the same functionality can be accomplished. In the first case you will see how the Full Custom Shower System is installed, and how it requires the installation of an extra Diverter Valve and also needs a lot of piping to be run inside the wall. Next, you will see how relatively simple the installation of an Easy Install Shower System is by comparison. Keep reading to learn more. What makes a Full Custom Shower System hard to Install? It's important to first understand a little about what it takes to install a Full Custom Shower System. Normal complete shower systems require 2 Rough-in Valves: A standard shower Rough-in Valve plus a Diverter Rough-in Valve. You use a Shower Control to start the flow of water to the shower valve. 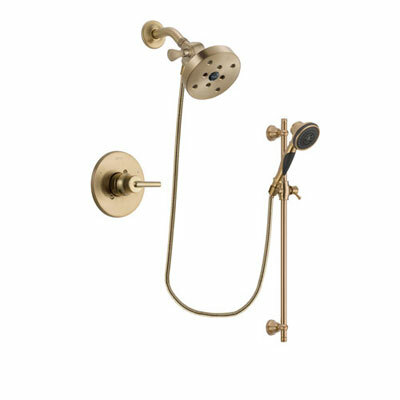 The standard shower valve is connected to your hot and cold water lines and mixes the water to a comfortable warm temperature for output. The output of warm water runs through a pipe up into the Diverter Valve. The Diverter then sends the water to multi shower heads, body sprays, handheld showers or whatever. In this example we show a 3-setting Diverter Control which supports 2 peripheral shower system sprays. This is a fairly typical configuration for a shower design. Read more about How to Build a Full Custom Shower. 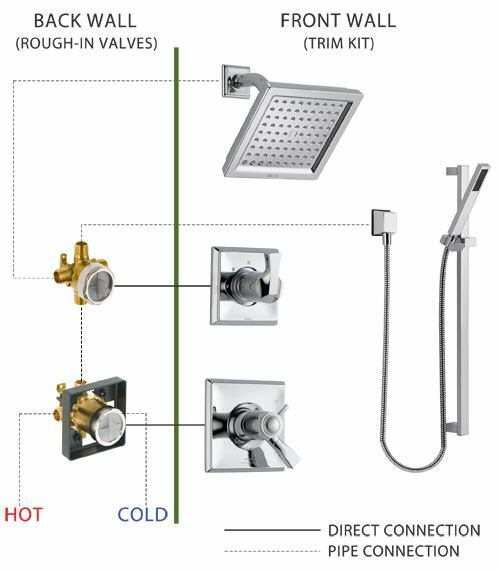 With this set-up, by using the 3-Setting Diverter Wall Control, any Shower Spray System can be turned on individually or both can be run at the same time. The 2 Rough-in Valves must be plumbed and pipes must be run inside the wall between the valves and all the peripheral spray systems. This is time consuming and labor intensive. In addition, when it comes time to tile there is even more work. The tiles must be cut and fit to allow for water to pass through to each peripheral spray. Finally, the Trim Kit elements must be fitted on top of the finished tile and connected to their corresponding Rough-in Valves. This means the plumber might even have to come out twice! Now don't get the wrong idea. The effect of a well-designed walk in shower with a Full Custom Shower System can be breathtaking. It can also be well worth it. Shower Systems in the Master Bathroom are proven to increase home value. Not only that but you also get to enjoy the best luxurious Shower on a daily basis. In some cases it may just be worth it to go all the way with a full install. But what if there was a way to get a similar experience without spending quite so much? 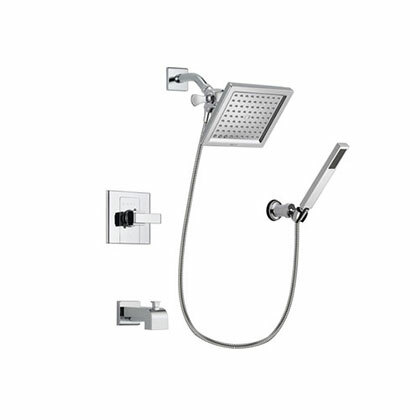 If you like the idea of having a Shower System where you can have a Showerhead and a Hand Held Shower Head both running at the same time with minimal installation hassle and cost then an Easy Install Shower System is right for you. Get a Cool Luxury Shower at a Discount! What makes an Easy Install Shower System easy to install? The primary reason is that Easy Install Shower Systems install in almost an identical way to a standard Shower Faucet. 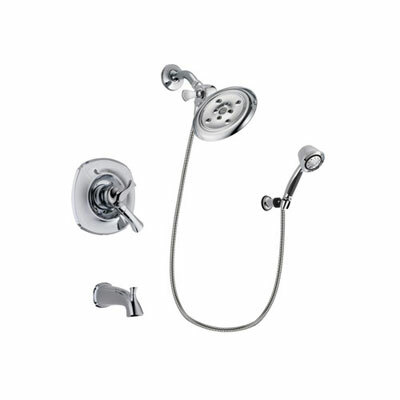 A standard Shower Faucet requires a Rough-in Valve and a Trim Kit. 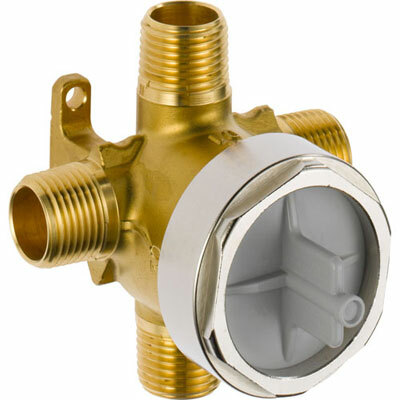 The Rough-in Valve is the piece that installs in the wall and connects with your home's hot and cold water lines. The Trim Kit is the outer portion that is visible after installation is complete. 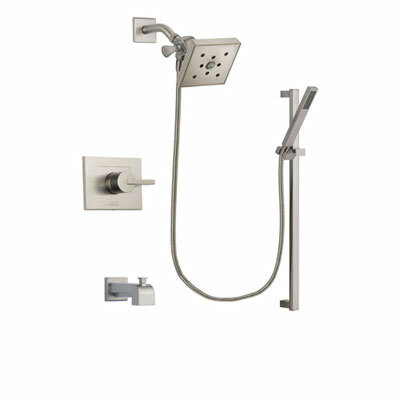 The Trim Kit consists of a Showerhead, Shower Arm, Shower Flange, Shower Control, and in the case of a Tub Shower Combo, a Tub Spout. The only real difference between a standard shower faucet and an Easy Install Shower System is the handheld shower and the 3-Setting Shower Arm Mount Diverter (shown on the right). This means installation is very similar to a standard shower and not much additional work is required. The end result however is the same as the Full Custom Shower System explained above! The function of the Easy Install Shower System is basically identical the Full Custom Shower System. You can run the Showerhead, the Handheld Shower, or BOTH AT THE SAME TIME!. The Easy Install configuration has the added benefit of making it possible to add a tub spout if your job calls for a Tub Shower Faucet Combo System. This advanced functionality can be achieved with virtually the same amount of work as it would take to install a standard normal shower faucet. An Easy Install Shower System requires only 1 Rough-in Valve, just like any normal Shower. The amount of piping necessary inside the wall is also identical. The trick is that the Diverter function happens outside the wall. Instead of installing the Diverter Rough-in Valve and running pipes through the wall you simply screw the 3-Setting Diverter Fixture to the end of the shower arm. You then attach the Shower Head to one output of the Diverter and the hose for the handheld Shower to the other. The integrated switch is what gives you control over the function. 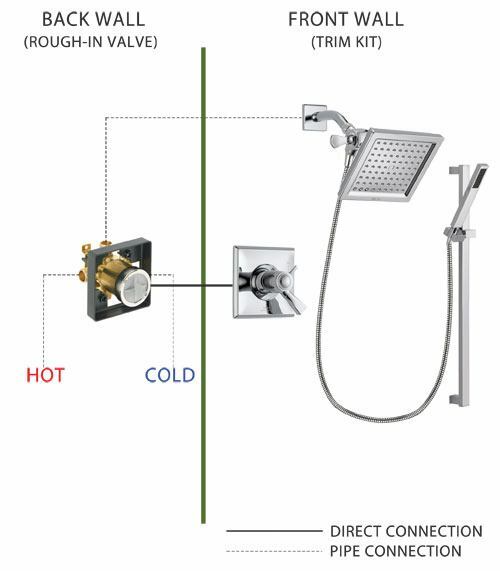 Depending on whether or not you need a Tub Spout, here are graphic illustrations which show exactly how our Easy Install Shower Systems function when you flip the 3-Setting Diverter switch. As you can see from the illustrations, the Easy Install Shower Systems give you full control over the functions of the shower. All that has fundamentally changed is that rather than installing the Diverter Valve inside the wall and running the plumbing lines underneath the tile inside the wall, the Easy Install Shower System has moved the Diverter to the end of the Shower Arm. By moving the Diverter function to outside the wall the installation becomes much more simple and easy. The amount of time it would take to install the complete Shower System drops from 6-9 hours down to 1-3 hours. At $60-90/hour for a plumber this difference is significant. 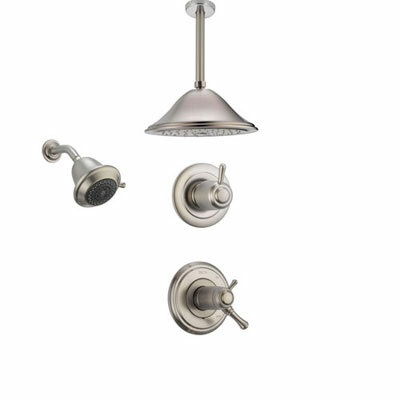 You could save as much as $720 by choosing an Easy Install Shower System! All without sacrificing your luxury shower experience! Another real benefit of the Easy Install Shower System is when it comes to bathroom renovations. If you are trying to fix up your bathroom without ripping out the tile, an Easy Install Shower System could be just the thing! Because the installation only requires only a single Rough-in Valve (like a regular standard shower) you may be able to get away with NOT tearing open the entire wall. Many Showers are designed so you have access to the Shower Valve from behind. If there is a normal plaster wall behind where your shower is installed you may be able to go through the plaster and change out the Rough-in Valve from the back. This means there would be no need to replace the tile at all. Patching a standard wall is much easier than fixing tile so make sure to check whether this is an option before tearing out the tile on the front side! If this case applies to you, you can change the Valve our without destroying the tile. Once the Valve is changed all it takes is attaching the Trim Kit and a few tile screws for the Hand Shower Mount and you'll be up and running! Where things get really cool is if your original Shower Faucet is already made by Delta. 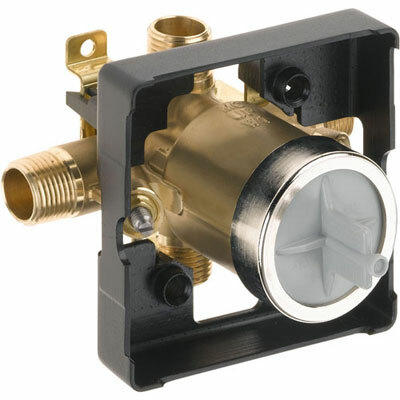 If you have a universal Delta Valve installed in your wall you can upgrade to an Easy Install Shower System without even touching the Rough-In Valve! Simply remove your existing Trim Kit (the part you see outside the wall) and swap it for an Easy Install Shower System Trim Kit provided by FaucetList.com. Changing from a normal Shower Faucet to a Shower System with Handheld might be easier than you think! What can you do with a Shower System that you can't do in a regular Shower? When coming up with Shower ideas or when considering replacing your Shower Faucet you should think about everything your Shower could be. Below are a few ideas that an Easy Install Shower System makes possible. Remember, you can use both the Shower Head and Hand Shower at the same time, or either individually. Having a Handheld Shower really adds a ton of functionality to your bathroom - some of which you might never even have considered! RELAXATION: Stand under two full sprays of water for a drenching effect that leaves you feeling super clean and refreshed. Handheld units double as massagers, and some include multiple settings which create a spa-like experience. After a workout, you can use a handheld showerhead to ease sore muscles with an at-home massage therapy session right in your own bathroom! FULL RINSE: Wash anywhere! With a handheld shower head, you will be able to wash anywhere on your body without any issues whatsoever. No more having to turn around to get the soap off your back. With a full drench Shower System you can rinse away soap and shampoo with little to no effort. WASH YOUR PET: Instead of sending your canine companion off to the groomer, save money by washing your pet at home. A handheld unit allows you to concentrate the spray right to where you need it, allowing you to wash away stinky pet odors. A handheld shower head can make washing your dog or cat a whole lot easier. If you are not able to wash your pet outside, whether because you do not have a yard or because of cold weather, a handheld shower head can be an extremely useful thing to have! CLEANING THE SHOWER: When it comes time to clean your shower and remove all of the dirt and grime, a handheld shower head is the perfect thing to have. 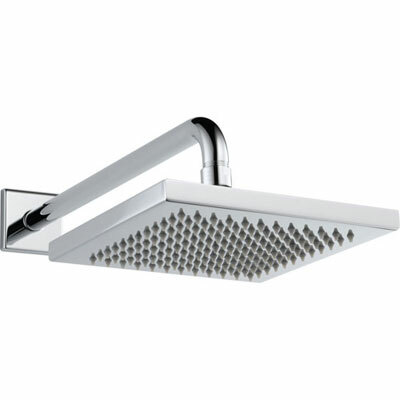 A handheld showerhead can make it easier to wash and rinse away soap scum from your shower walls or tile floor. It also helps with rinsing away any cleaning solution/spray you have used. These units allow you to spray down the walls quickly before scrubbing with a cleaning solution and then rinse them clean to restore the look of your tile and grout. You can also use the Hand Spray to wash other household items like hard-to-clean mini-blinds. SPOT WASHING: If you or your kids like to walk around barefoot in the summer you can use a handheld Shower to wash your feet before bed. GREAT FOR LONG HAIR: Use the Handheld Shower to help thoroughly rinse shampoo out of long hair. Or if you have long hair you know that sometimes you want to take a shower but don't want to get your hair wet because it will take a long time to dry. A Handheld Shower makes this easy! 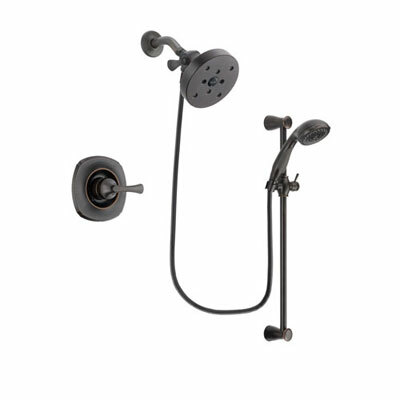 These showerheads can help you to wash up while keeping your hair dry, and for women, they also serve as the perfect tool for leg shaving. BENEFITS FOR OLDER FOLKS: Having a Hand Shower is great because it can be used easily from a seated position. Slipping and falling in a shower is a danger for even younger able-bodied people, but it can be especially dangerous as you get older. A handheld showerhead can be a great help because it eliminates the need to turn around in the shower, so you can keep movement to a minimum. Instead of twisting and turning to rinse the soap off your body, why not just invest in Easy Install Shower System? BENEFITS FOR THE YOUNGER FOLKS: If you have children, a handheld shower head is definitely a good investment to make. 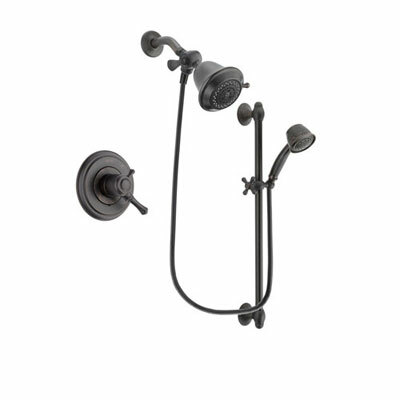 This type of shower head will make it much easier to get smaller children clean because you won't have to keep turning them around to get all of the soap off them. If you have small children in your house, a handheld shower head will allow you to rinse all of the soap off them with a gentle stream of water while staying out of the shower and not getting wet yourself. Shower Systems are designed to operate in an environment where there is plenty of water. Shower Systems use more water than a standard shower and therefore there are some regulations you should be aware of. In certain states, Shower Systems will not meet local plumbing code. If you are building a new home and need to pass inspection, you should consult your local plumbing code to find out if there are any restrictions on shower head water output. For those living in California, Georgia, Texas, Colorado, and some areas of New York this is particularly important as low-flow regulations have set standards that a Shower System may not comply with. Unfortunately as regulations vary significantly from place to place (and sometimes change) we can't offer you any information on the local code in your region - you will have to check on that yourself. Order your Easy Install Shower System Today! With functionally very similar to many Full Custom Shower Systems, an Easy Install Shower System offers the same great benefits at significantly reduced price. Save on the labor expense of installing a complex Shower System and make things easy! We have created these packages to include everything necessary for installation. 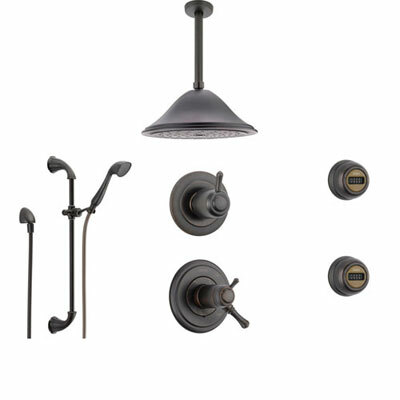 Don't waste hours hunting down all the components fixtures to create a Shower System. Shop from our pre-designed Easy Install Shower Systems created with products and styles that have popular customer demand. 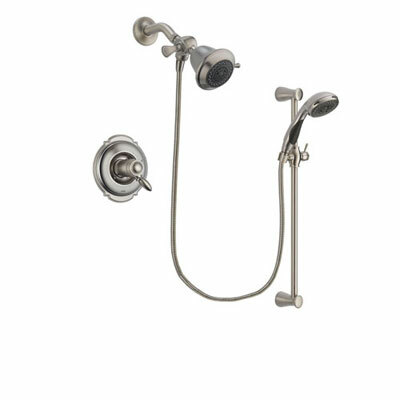 At FaucetList.com our goal is to make shopping for Bathroom Shower Fixtures easy! Taking a Shower is a daily occurrence so why not make it something you enjoy and look forward to? A relaxing shower experience that is truly luxurious can really improve your quality of life. Do something for yourself and end boring showers for good. Benefit from our expertly designed Easy Install Shower Systems and get all the luxury of a full shower system for less! Our Complete Shower Systems are quick to install and look great. Add style and function to your bathroom with just a few minor adjustments. We are here to help! If you have any questions about how everything works we have expert help available to assist you. We wrote this guide to try and explain things as best we could but this stuff can be a bit tricky. If you require assistance with configuring your perfect system or need other help Contact Us! All our FaucetList.com Pre-built Systems have been expertly optimized for function and water pressure. All products are guaranteed to match each other perfectly and work together without issue. 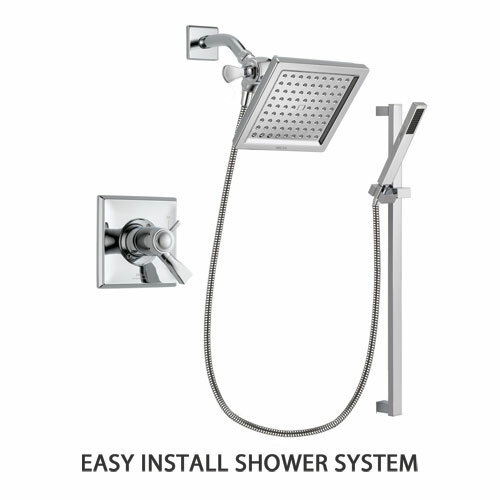 Get a complete Easy Install Handheld Shower System with just a few clicks. Free Shipping, 30 Day Easy Returns, No account necessary! Order yours today! Hi Mark, unfortunately the regulations vary state by state and the rules have been changing rapidly in the last several years. You would have to check with your local jurisdiction as sometimes this varies even on a county or city level. An easy install shower system with both hand shower and showerhead running at the same time will use between 3.5-5 gallons per minute. This may or may not be allowed in your area so you will have to determine that on your own. I wish I had some better resources but we are not in Colorado so I’m not familiar with the current water usage standard there. Thanks! I couldn’t find anything from Colorado about limits to water use for a multi-head, jetted shower. I know that they use far more than the 2.5gpm of standard shower heads. Can you point me to anything?